The Samsung Developer Conference kicked off yesterday, and will continue today, in San Francisco. During yesterday’s event Samsung took quite a bit of the stage time talking about Bixby, which is evolving into a scalable intelligence platform to support the diverse products and services, and discussing SmartThings which it intends to bring IoT to a single app controlling home, car, office and everywhere in-between. Eventually it got onto the news that most gadget and smartphone enthusiasts were interested in; smartphones with flexible displays – dubbed Infinity Flex Displays, and the One UI which will make working with such a device intuitive and pleasurable. On stage Samsung’s SVP of mobile product marketing, Justin Denison, showed off a smartphone with a foldable display in action. Closed it had a compact display filling most of its face, when opened the user would benefit from a screen with a 7.3-inch diagonal. Media and developers didn’t get a chance to go hands-on with the new device - which looks rather chunky when folded but is very pocketable. Looking closely at various images the front display when folded looks to have sizable bezels but it still very usable on the move. SlashGear reports that the images show the Samsung SVP holding the Infinity Flex foldable smartphone “in a box” so that it wouldn’t reveal too much to rivals. The design does indeed look boxy right now and SlashGear as lots of pictures with the exposure pumped up to show more details in the shadow. Google had sent head of Android UX, Glen Murphy, to talk about the software side of things with regard to foldable displays. Samsung’s new One UI is the firm’s new Android experience, and includes the foundations of native foldable device support in Android. Thanks to this work there will be a standard way that Android apps and interfaces respond with the form-factor switching devices. Why would you buy a smartphone with an Infinity Flex Display? 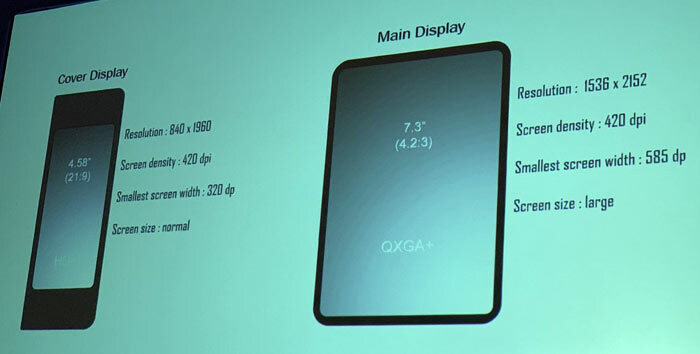 Samsung says that a pocket sized device can seamlessly unfold into one with a 7.3-inch display. A user’s app experience will “seamlessly transition to the larger display as the device unfolds”. Multitasking ability is said to be enhanced with the large display roomy enough for up to three active apps at once. It is expected from Google’s presentation, that Samsung will have a foldable phone ready for MWC 2019 reveal and shipping in the weeks/months after that big event. As a reminder, we saw the first commercial foldable flex display smartphone launched by Royole a week ago. Yes the thickness is a problem as a mobile should fit in your pocket, perhaps thickness will be reduced over the generations. I can't say that when i look at my phone i wish the display was bigger so to me this hold little appeal, apart from using it with a DS emulator and having space for both screens :P. I'll be interested in how the hinged bit of screen holds up over time. It's as if tech companies instinctively know how thin something has to be before I drop it, and then make it half an inch thinner, just to make me drop it…. because then I have to buy another, innit. Despite having a stupidly big phone already, ther are times when I'd find it useful - Gaming, doing spreadsheets, reading a technical manual or schematic in Kindle or PDF… Movies too would be better and I'm sure I could think of a dozen more.